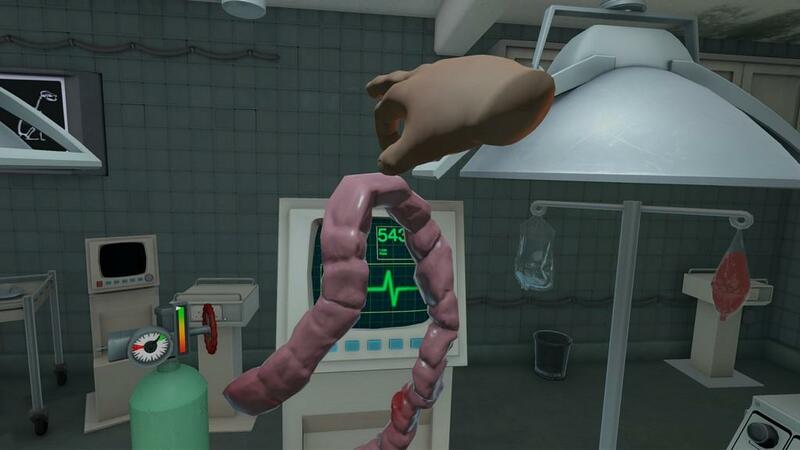 One of the more quirky games I enjoy is Surgeon Simulator. This frustrating fun filled game took up a lot of my time as I worked on getting every single achievement out there. When I got my Oculus Rift DK2 and Razer Hydra, I longed for the ability to play it in VR using motion controls. 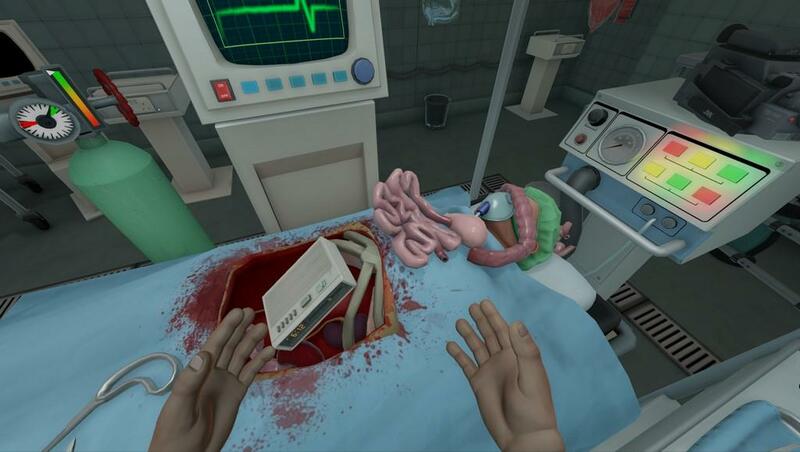 It worked for a little bit, but Bossa Studios never did really put full support into letting you play Surgeon SImulator in VR until now. 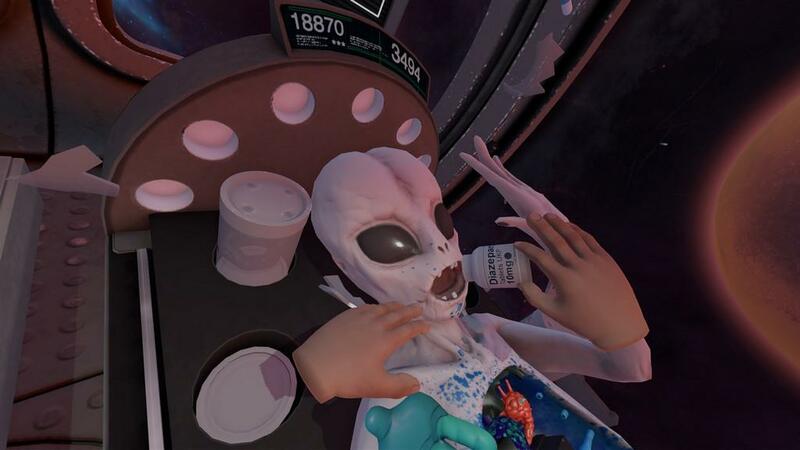 Surgeon Simulator ER is the fully realized VR version of the cult game letting those who have an Oculus Rift with Touch or an HTC Vive perform life saving surgeries in a virtual environment. The game plays pretty much the same as the original with some changes. First up, you now have two hands instead of one so you can multi-task with ease. Doing the eye transplant? Hold the jar of eyeballs in one hand while you use the other to pluck them out and stick them in the eye sockets. Looking to complete the kidney transplant quickly? Yank both bad kidneys out at once and put the good ones in without having to wait for one hand to free up. Being able to use two hands in the game really makes for a lot less frustrating experience. Oh, you’ll still run into some issues like your hand getting stuck in areas, but the move to two hands does ease the pain a bit. For some, this might lessen the appeal of what made Surgeon Simulator fun in that you had to fight the controls to get things done. For me, I enjoyed being free to use either hand on certain tasks and found it to be a different but still fun to play. 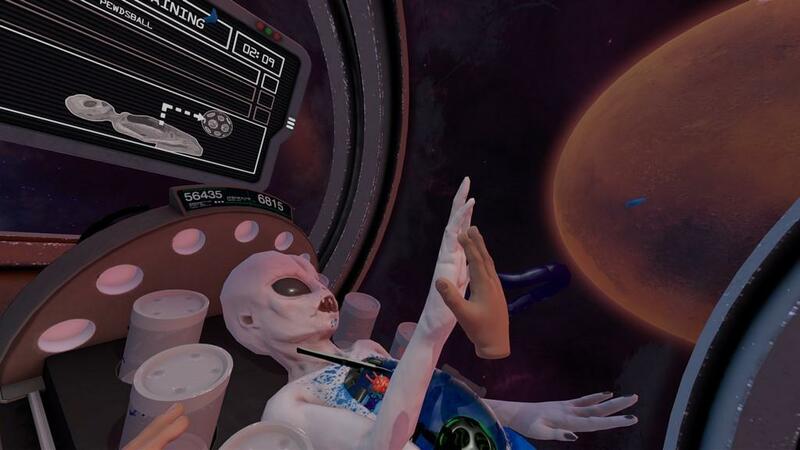 On the HTC Vive, you close the hand by pressing the trackpad and palm buttons. This setup can be a little bit awkward at times, but I didn’t have too many issues with it. For the most part, gripping items wasn’t frustrating and I was able to work my way through even the most delicate of procedures using the Vive wands. Bossa did throw in a few things to take advantage of the second hand. The brain surgery level happens during a power outage so you’ll have to hold a flashlight in one hand while performing the surgery with the other. Having the ability to use a VR HMD lets you freely look around easily and immerse yourself into the game. Whereas in the original game you had to slowly pan your arm around to reach certain things, you can just quickly turn your head, grab it with your hand, and go about your business. It adds a nice level of immersion where you are surrounded by the environment and you don’t feel constrained in your view by a monitor now. I can now quickly scan the room for what I need making me do these surgeries with more effectiveness. On the wall will be a monitor where you can switch the video feed giving you different angles of the surgery. You can even watch yourself perform if you so desire. 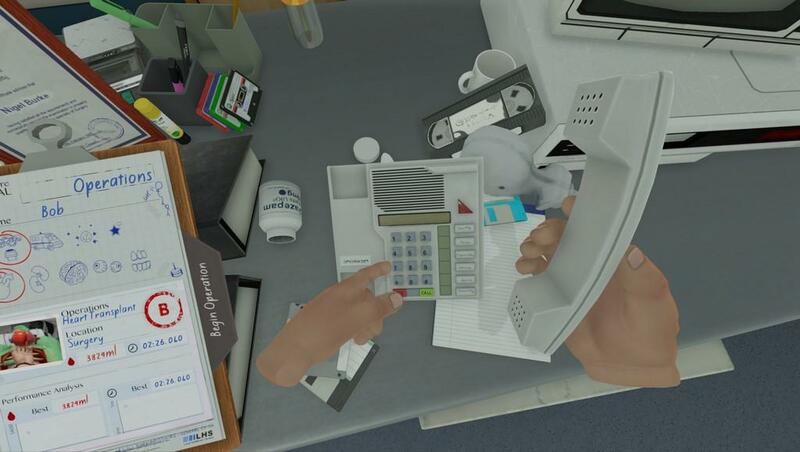 Bossa also did a cool thing and added a placeable camera, much like Job Simulator’s camera allowing you to set up how you want viewers to see you play. There are some other change to the original game to accommodate playing in VR. Thankfully, all the ambulance levels take place without any bouncing or otherwise, we’d have a lot of sick Surgeon Simulator ER players out there. Instead, the items will jump up occasionally to throw you off. But, without the constant movement in the ambulance levels, the these levels are easier and there’s not that much that distinguishes this part from the hospital levels. In the space levels, you can control how the space station moves, which can help you reach some of those items that have floated away. Two levers allow you to move the space station side to side or up and down. The objects inside will react accordingly when hitting a wall so if you lost that scalpel far down the room, just move the space station a bit and have it float back towards you. Yes, you can walk towards them if you so desire, but the station controls makes retrieving items easier. From what I experienced, you’ll have mostly the same levels and you’ll have to do the same tricks and surgeries to unlock them. With the way your hands work now, it’s a ton easier to press the keypad for the space levels. 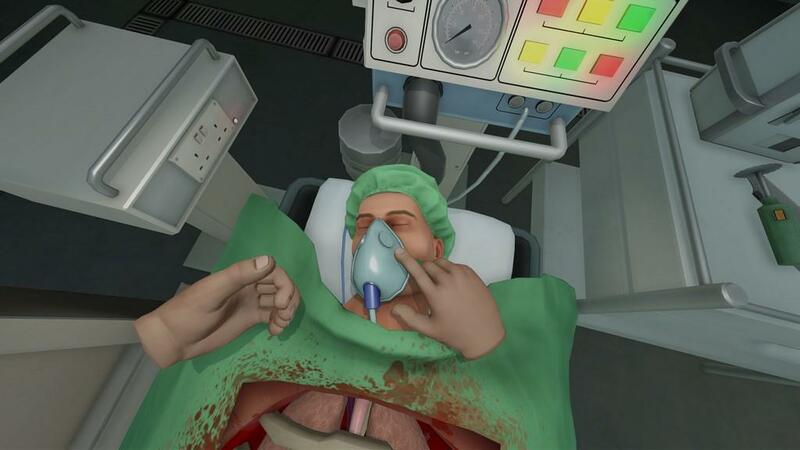 If you’ve already went through the regular game, you’ll have no problems going through Surgeon Simulator ER since the criteria for all the surgeries remain the same. The game looks pretty much the same so don’t expect an improve visual experience. The major jump is towards being in VR. 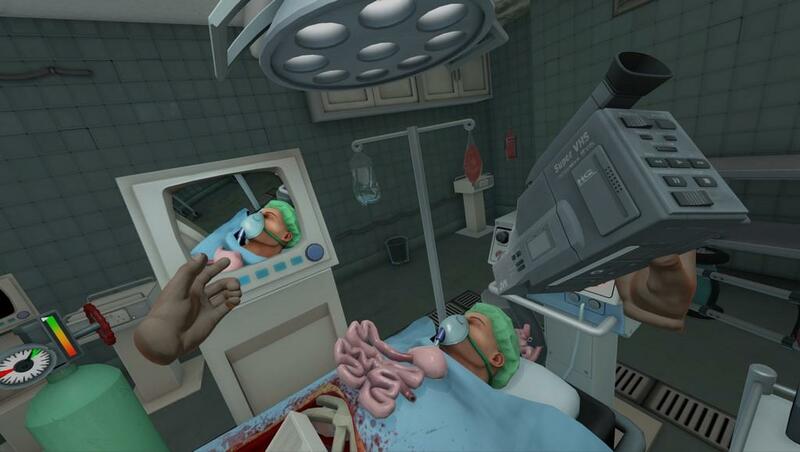 Having played the previous game with the Oculus DK2 and the Razer Hydra, I was pretty stoked to finally get full VR version of Surgeon SImulator. 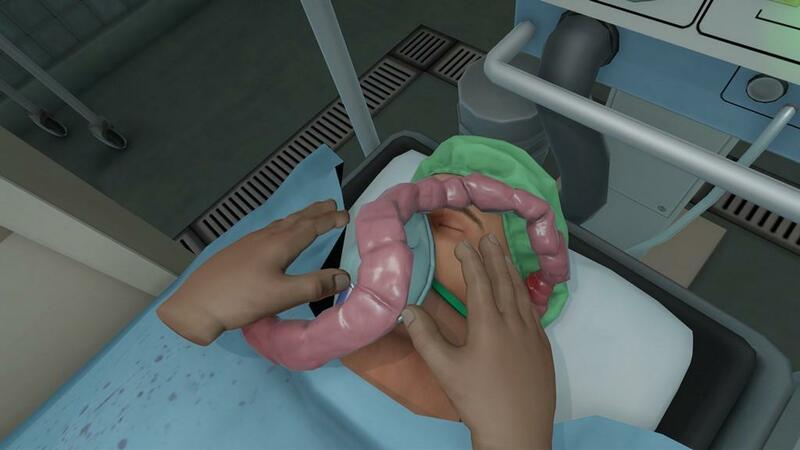 Just like the original, the replay value mostly depends on doing the surgeries in a certain way to get the achievements or experimenting with different ways to complete them. I did spend my time getting every single achievement in the original game, but I think I’m in the minority on this. 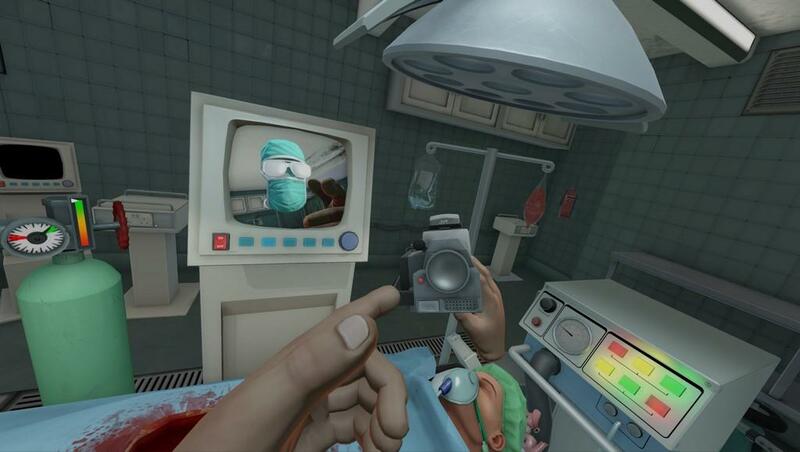 Surgeon Simulator ER completes the requests by many VR folks for the original game to be played this way. It doesn’t present too much new in terms of gameplay or graphics. If you didn’t enjoy the original game, you’ll probably pass on this one as well. 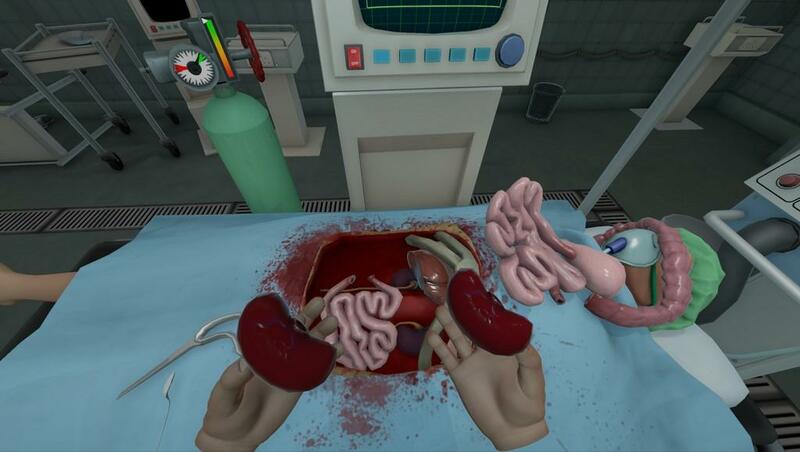 Surgeon Simulator isn’t for everyone and doesn’t have the mass appeal as say Job Simulator, but for those that found some fun and charm in the original game, Surgeon Simulator ER can give you a new way to play and some more enjoyment out if it.